Ferris State and Ohio State ended the weekend the same way they began it - locked in a tie for fourth place in the CCHA. The Buckeyes sanpped the Bulldogs' two-game winning streak with a 3-1 decision in the series opener, only to have Ferris State return the favor by flip-flopping the score to their advantage on Saturday. In the first period of Friday's match-up, Ohio State took care of most of their business in the first period, with scores by Alex Szczechura at 8:22 and Chris Crane 14:46. Following a scoreless middle stanza, the Buckeyes added to their total in the third courtesy of another Crane goal with just 1:52 elapsed. The Bulldogs were able to break-up Brady Hjelle's shutout bid midway through the frame on a Justin Buzzeo marker from right side of the net. Earning a spot on the scoresheet with their assists were Dom Panetta and Travis White. Hjelle outshined Ferris State netminder C.J. Motte with a 37-24 advantage in the saves department. Success went the Bulldogs' way in the series finale, with forwards Travis Ouellette and Dakota Kletcha scoring their goals a minute apart to make it a 2-0 game after the first 20 minutes of play. The score remained that way until 7:54 in the third, when Ohio State's Max McCormick cut the lead in half after banging in a rebound off the dasher. Initiating that scoring play for the Buckeyes were Al McClean and Tanner Fritz. Senior captain Kyle Bonis gave the Bulldogs a sigh of relief with 24 seconds left, scoring on an empty-netter to mark his team-high 10th goal of the campaign. Motte and Hjelle both finished with 25 saves apiece. 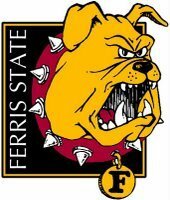 Ferris State (10-9-3 overall, 8-7-1 CCHA) faces Michigan State (6-13-3 overall, 5-10-1 CCHA) in a home-and-home series this weekend, beginning with a trip to East Lansing on Friday before venturing back to Big Rapids the following night. Friday's game between the two schools can be seen on Fox Sports Detroit, with faceoff scheduled for 7:35 pm.